Photograph courtesy of Devon & Somerset Fire & Rescue Service. Whilst a few thatch fires are a result of the spread of fire from elsewhere inside or outside the building, the association with chimneys serving solid fuel fireplaces, stoves or ranges has been recognised for some time. Traditionally, it was assumed that the thatch was ignited by embers emitted from the chimney but this assumption was challenged by the work of Angold, Sadd & Sanders at RHM Technology Ltd, as described in their report “Fire and Thatch” (1998)1. This highlighted the possibility of heat transfer through the chimney structure into the thatch, thus causing ignition. Although no actual cases of high temperatures in thatch in buildings with chimneys in use were demonstrated in the report, this heat transfer theory has gained widespread acceptance over time amongst those with interests in thatch fires including Fire Brigades and Local Authorities. Hence advice that “more than 90% of fires in thatched properties are caused by faults in the flue or chimney” appears in some Fire Service advice. 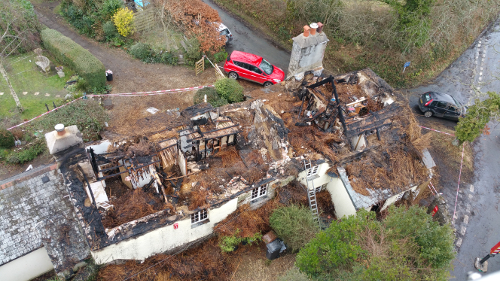 With the above in mind, an ongoing review has been undertaken of thatch fires investigated by Burgoynes nationally, which now numbers 103 fires between 21 December 2008 and 1 July 2016. These investigations have been undertaken by several Burgoynes forensic scientists and engineers, but predominantly by those located in the Midlands, East Anglia, South East and South West. Of the 103 thatch fires, 82 originated in the thatch and of those there was a strong association, as expected, with wood burning stoves (66) or open fires (13) in use. Other causes included electrical faults, downlighters, arson and even lights used to grow cannabis in the loft. In one case there was no fire alight but a bonfire was taking place close to the building. Flue liners were present in all 67 cases involving wood burning stoves (see figure A), which was to be expected since in recent times a liner has almost always been fitted along with the stove. One open fire was also connected to a liner. In 58 of those 67 cases, the chimney was less than 1.8 metres high, the minimum height specified in the Building Regulations 2000 for combustible roof coverings, including thatch. 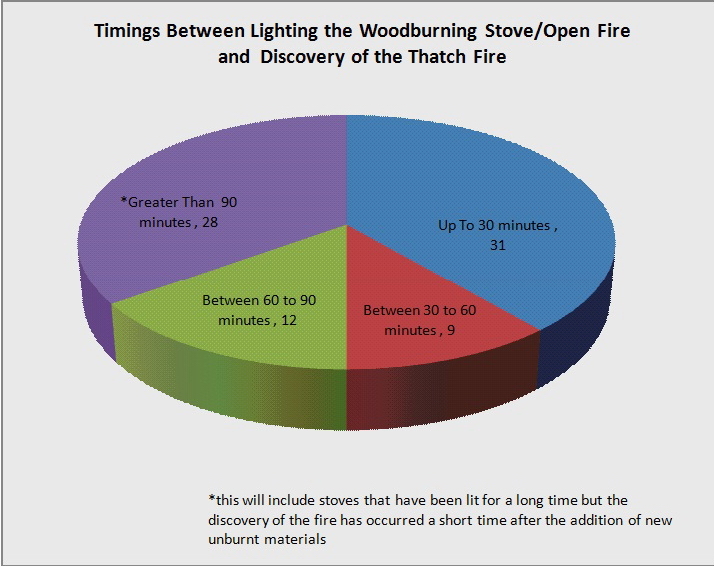 The time between the lighting of the stove or fire and discovery of the fire was also examined and out of the 80 fires for which timings were known, 31 occurred within 30 minutes of lighting, 9 between 30 and 60 minutes and 12 between 60 and 90 minutes (see figure B). Thus a total of 52 of the 80 fires occurred within 90 minutes of lighting, a striking statistic. Moreover, in a number of other instances, fuel had been added to an existing fire within 60 minutes of discovery. A further factor was that in 11 cases a chimney fire was identified as having occurred. 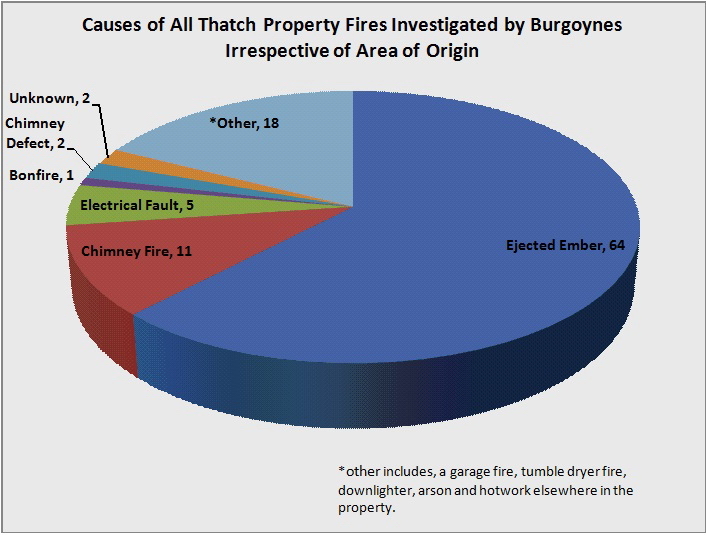 Looking at all of the 103 investigations (see figure C), by far the most common cause identified by Burgoynes was an ejected ember (64), with the next most common being chimney fire (11) and electrical (5). A chimney defect was only identified in 2 cases. As stated previously, the association of thatch fires with wood burning stoves was to be expected but the occurrence of liners, low chimneys and a short time between lighting and the fire is also striking. Typically, flexible metal liners are used which may be insulated with mineral wool or Vermiculite (or occasionally factory made insulated sectional flues are used) and the absence of cold secondary air and a small diameter compared with a traditional chimney results in a strong draught soon after lighting. Whilst often advocated for safety reasons, liners ironically have an increased tendency to carry embers from the fire on to the roof, especially when combined with the low chimneys often found in thatched properties. Where there is a short time between lighting and the discovery of the fire in the thatch, these fires in particular are best explained by embers produced during the lighting process, rather than heat transfer through the structure, which would require a prolonged period of operation. Chimney fires, which almost always eject much more burning material from the chimney and are therefore very dangerous for thatches, were only been recorded in 11 cases. However, it may be that more have in fact occurred, because chimney fires are relatively transient, may not be noticed by the occupants and have often ceased by the time fire-fighters arrive. Finally, it has been observed that there is an association between the number of thatch fires referred to Burgoynes for investigation and spells of cold, dry weather. Clearly, cold weather will result in the use of wood burning stoves and it is suggested that in dry weather thatch is more readily ignited by embers, it not necessarily being continuously damp in the autumn, winter and spring. There were noticeably fewer fires during the 2011-2012 heating season which can be attributed to the milder winter and the large amount of rain in 2012. In contrast a spate of fires occurred in a short period in late March and early April 2013 during which we investigated 12 thatch fires in under 3 weeks. This compares with the same number in over 11 months between April 2012 and March 2013 and coincided with a spell of cold, dry weather, which reinforces the view that embers are responsible. Another factor may have been fires caused by stove use when chimneys were heavily sooted towards the end of the heating season. All 15 fires started in the thatch and in all cases a solid fuel stove with a liner was in use. Five were discovered within 30 minutes of lighting, three between 30 and 60 minutes, two between 60 and 90 minutes and five over 90 minutes. 13 of the 15 had chimneys less than 1.8m high and 8 had bird guards or spark arrestors (most of the 8 had bird guards). In all instances there was dry weather immediately prior to the fire. Burgoynes attributed 13 of the fires to ejected embers and 2 to chimney fires. 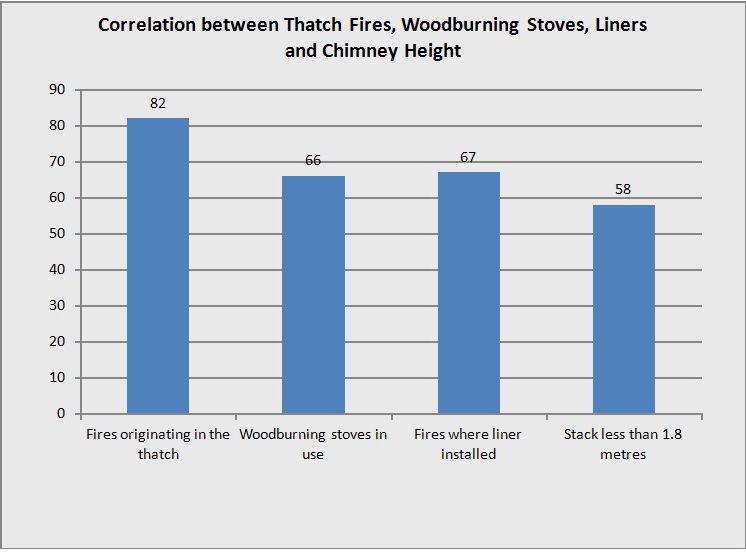 Again, the correlation between thatch fires and solid fuel stoves with liners and low chimneys was demonstrated, together with a short time between lighting and discovery. There was also a notable correlation with dry conditions and evidence that bird guards and spark arrestors do not necessarily prevent thatch fires. The effectiveness of spark arrestors is hard to assess since the number in use and where fires do not occur is unknown, but they are clearly not 100% effective. Furthermore, there was a correlation between dry weather and thatch fires. It further supports the view that the majority of fires associated with chimneys arise from ejected embers, often generated during lighting the fire, rather than defects in chimneys or heat conducted through the structure. In 2018 the Fire Protection Association published a report “Fires in Thatched Properties with Wood Burning Stoves” on work carried out at their Moreton in Marsh laboratories sponsored by Historic England and NFU Mutual. The principal findings included “The widely accepted idea that heat transfer by conduction (i.e. ‘heat Transfer Theory’) is the predominant mode of fire raising in thatched buildings is not supported by the test data”.